Bay 101 News: 20k or 120k? 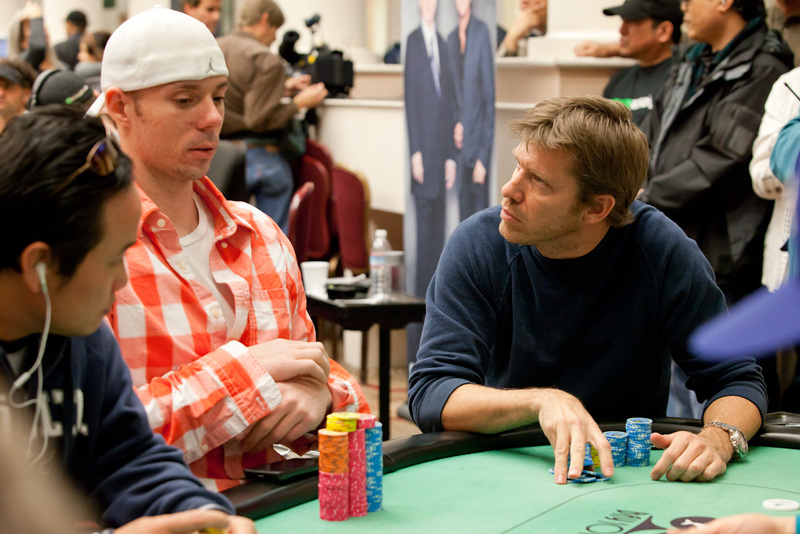 Some controversy broke out on table 23 when Layne Flack (above right) checked the river and Matt Berkey (above left) bet. Matt had bet "120" dark before the river hit for 120,000, but Layne had thought the bet was 20,000. Layne called, but a floor had to be called over to decide the bet amount. A few players at the table all chimed in that they heard "120," as did a few members of the media. Tournament director Matt Savage ruled the bet 120,000, and Layne was forced to put most of his chips in the middle. Layne had top pair, top kicker with his AK, but Matt had made a straight. Layne is left crippled with approximately 50,000, and is very steamed at the decision. With the blinds at 2k/4k, it is anticipated that Layne will be all in a few times before the end of this level.